[New for 2015] You know, it's a good thing I went back to Target this morning because the selection of cookie cores was already pretty well picked over... ok, technically it was a good thing / bad thing as I fell on the stupid black ice, but I'm fine since the car partially broke my fall. Anyway, let's check out the speculoos one first since that seems to be grabbing everyone's attention. Here's hoping this has more flavor than the Trader Joe's version. Exposed core (in bad lighting).... too tempting to resist.... yup, that tastes like a biscoff cookie.. but note, I said it tastes like the cookie, not the cookie butter. Splitting hairs? Yes, but I'm just trying to set your expectations on the viscosity of this tempting core [though it is more pliable that the peanut buttah cookie core and the boom chocolatta cookie core I tried]. It's good, it's just a bit more mild and textured than you might expect. Mmmmm, those are some crunchy cookie bits, I like it! Wow, just wow. That cookie against a super rich vanilla is superb. The way the flavor lingers is epic. This half of the pint could be a flavor all on it's on, it's just that rich on the ending. Like any fun flavor, there are cookie bits everywhere, no skimping here. 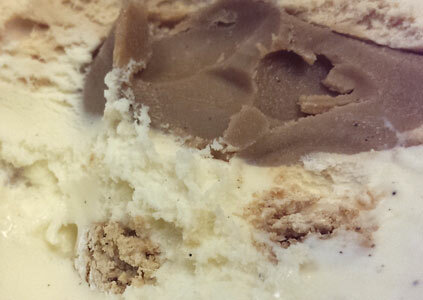 The cookies taste spicier against the "dark" caramel ice cream. I don't know how the ice cream is "dark", but it just isn't that strongly flavored, so it's not highlighting the same cookie notes like the vanilla did. Let's mix in some cookie butter core here... yeah, it's better that way. It's hard to not get a cookie bit on every spoonful. Yeah, I like this one (obviously). I'm thinking that if you miss oatmeal cookie chunk, then this will be a suitable replacement for you. My only warning here is that eating the caramel side might coat your tastes buds and mask your appreciation of the vanilla side. On Second Scoop: Of the three cookie cores I tried, this is the only one I polished off in two sittings. The flavor profile is great, there's a crunchy cookie in every bite, and then there's the core for an added fun factor. No, it may not be exactly what you envisioned, but if you try any of the new cores, start with this one. Note: In Europe, they keep the core and cookies but go with a straight caramel base. It's known as Speculoos? Specu-Love. 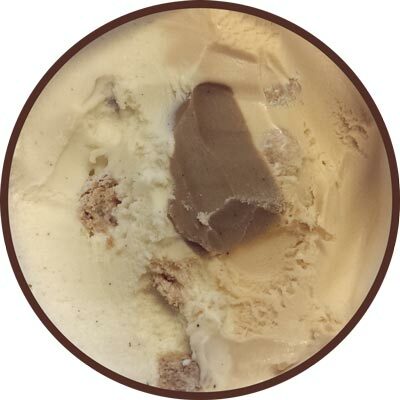 Do you remember Haagen Dazs' Spiced Caramel Biscuit ice cream a couple of years ago that was a limited edition? 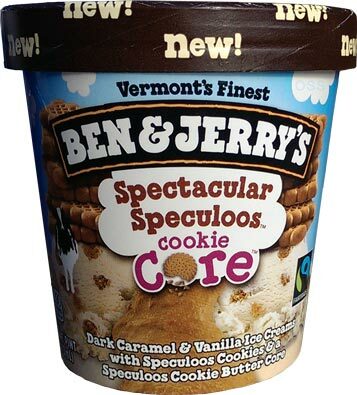 I was wondering how it compares to B&J's Spectacular Speculoos Cookie Core ice cream. @Stride: It's hard to compare since they are very different beasts to me. HD is mild and pleasant, this one is chock full of crunchy fun. It's a very different experience. I was a little disappointed with this one. The caramel ice cream base was pretty boring and half of the cookie bits were soft and squishy (they're coated in "something" to make them retain their crunch, not sure what it is...) I mean, it was still good, just not AMAZING. I have desperately missed Oatmeal Cookie; thanks for the tip. I have been trying to find this one everywhere but no local grocery stores seem to be carrying it yet. I no longer live by a Target so I hope it will be in wider distribution than that or Walmart. The stores here have very small selections of B&J's unfortunately. If this resembles Oatmeal Cookie Chunk I am going to die and go to heaven. B&J lost their minds for putting it into the grave yard. Amen on the oatmeal cookie chunk! I would give anything for Ben and Jerry's to bring that back. Here's to hoping this can suffice the cravings! Me, too! I'll give the Speculoos Cookie Core a try, but without the fudge flakes I can't imagine that it could come close to the euphoric delight of what was without a doubt B&J's best flavor ever! They really need to bring that one back. what state are you in. I can't find them in maryland? This is NOTHING like Oatmeal Cookie Chunk. Its pretty vile and disgusting. First of all, the 'Speculoos' cookies pale in comparison to Oatmeal cookies. I didnt even know what they were to be fair. Later came to learn that they are some European shortbread type of cookie, but they are just bad. Plain, boring, like one of those dollar store shortbread cookies with some cinammon flavor. The little chunks of the cookies everywhere was ok. The cookie core was just bad bad bad. Im probably one of the few, but I dont get cores at all in any of their core lines. They taste nothing like the actual cookie, theyre not ice cream at all so youre loosing ice cream to get some somewhat disgusting syrupy center. I mean I LOOVE chocolate and go gaga for Chocolate Therapy but even the chocolate cookie core of Boom Chocolatta in the cookie core line made me sick. This was my first and last core line purchase of any kind from B and Js. Not a fan. Sorry for your frustration D, but I have to ask, have you ever had Biscoff cookies (brand name Speculoos cookies)? It's seems like a no. I will admit they aren't typical American cookies, but they do grow on you. I get them for 2 bucks a pop at market basket. Have you finished the pint yet? 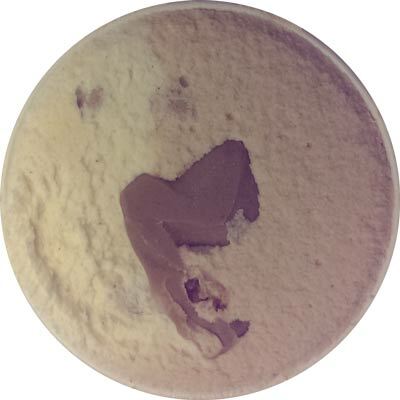 Have you tried to avoid the core and just sample the cookie bits in the vanilla? Or, when all else fails, use it to make a chocolate milkshake. shame on the packaging people! I hate cinnamon and only the fine print reveals that this ice cream is basically cinnamon flavored!! (I hoped the "caramel core" was just caramel--alas!!) please change the packaging to reflect this idiosyncratic flavor that many people aren't expecting nor like! !